Anything I can do to save washing up dishes after dinner is always welcome. Aside from making the washing up easier, building the dish in one pan gives you a unique opportunity to develop some pretty robust flavors. 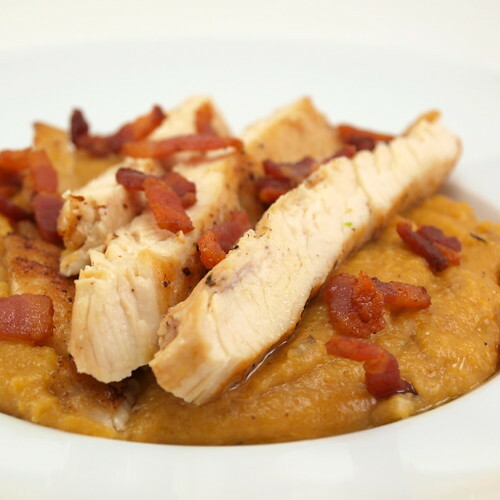 You never lose any fond, the caramelized bits that get stuck to the bottom of the pan, so all that flavor makes its way into the polenta. 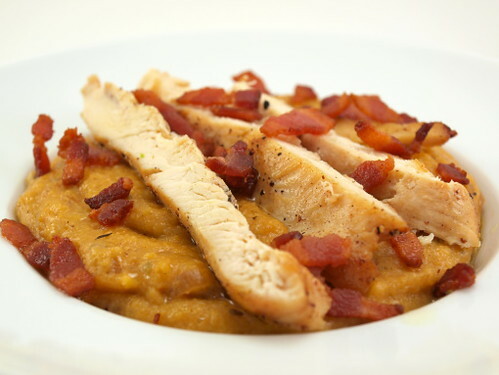 This dish starts with some automatic flavor in the form of bacon. Of course, you can substitute pancetta if that rocks your world, but I liked the additional smokey flavor the bacon added. Again, it is all about those layers of flavor here. I also made my life a little easier and went for instant polenta. It cooks really quickly which makes this dish a snap to make. 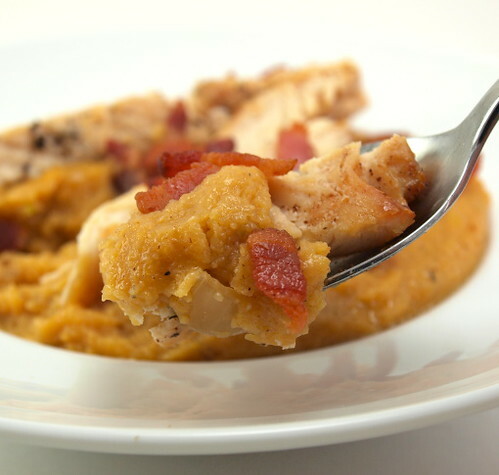 Within about 40 minutes you have a hot, hearty, and satisfying meal ready to go. Did I mention the bacon? 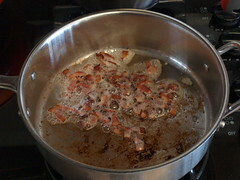 In a medium skillet over medium heat cook the bacon until crisp, and the fat has rendered out. Remove the bacon from the pan and reserve. Increase the heat to medium high. 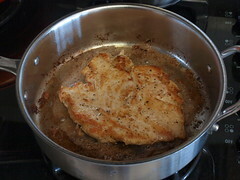 Season both sides of the chicken with salt and pepper and place the chicken in the hot skillet. 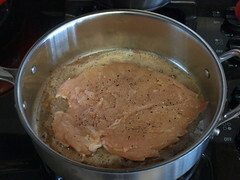 Cook until the chicken is browned on both sides and has an internal temperature of 160F, about 5 minutes per side. Set the chicken aside, covered in foil, to rest while you prepare the polenta. 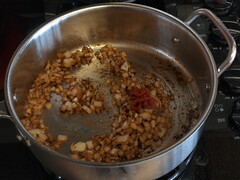 Reduce the heat in the pan to medium and add the onion. Cook for three minutes, until it begins to soften, then add the oregano, fennel, and crushed red pepper. 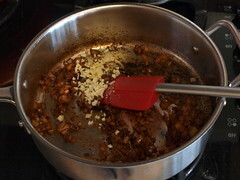 Cook for about thirty seconds, until the spices are fragrant, then add the tomato paste. Cook for one minute and add the garlic. Cook for thirty seconds. 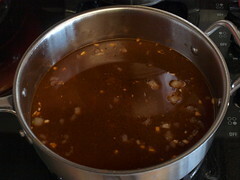 Add the chicken stock and scrape the brown bits off the bottom of the pan. 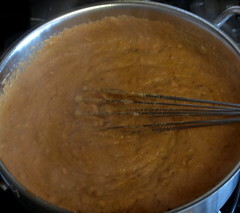 Once the stock reaches a simmer whisk in the polenta and cook for 3 to 5 minutes. Turn off the heat and add the cream and cheese. Stir well. 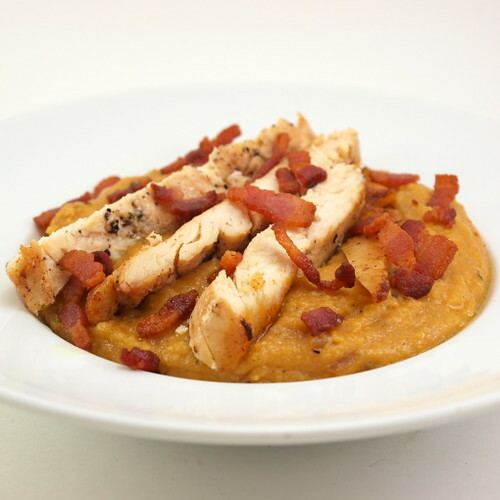 Serve the polenta immediately with slices of chicken and the crisp bacon on top.